You are here: Home Forum Home Member Projects 62 Shell Lake Sportsman 14' Lifeboat?? 62 Shell Lake Sportsman 14' Lifeboat?? 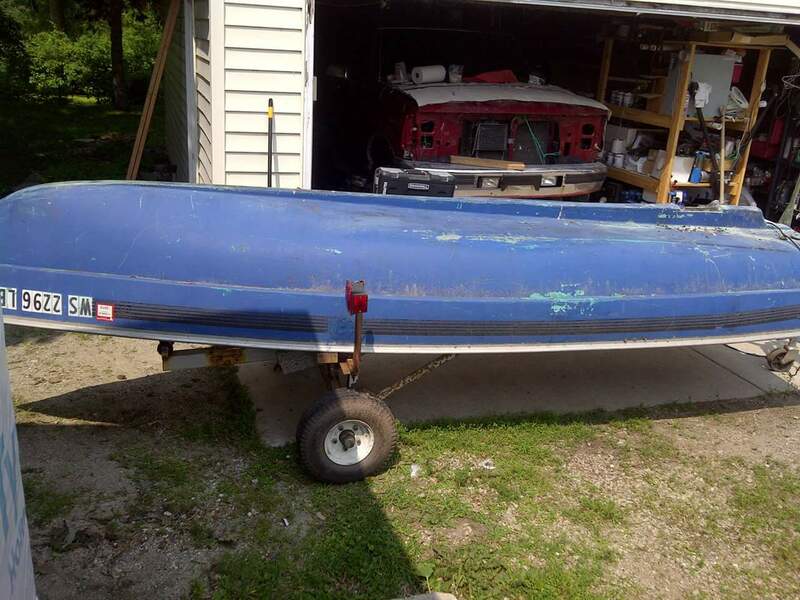 TOPIC:	62 Shell Lake Sportsman 14' Lifeboat?? I have been attempting to fix up this old boat for some years now. I picked up a new sander and was testing it out. I uncovered letters that were hand painted in white with black shadowing. It looks like it says "Lifeboat", but it seems parts were worn off before the blue paint was added. Could this really be a lifeboat from a bigger ship? Or, is their more simple reason for it to be called lifeboat? The boat was given to me by a friends grandfather in Rice Lake WI. It had a really bad keel repair with green bondo style fiberglass sometime in its life. I've been making steady progress on the Shell Lake. Rotten old balsa keel, is now a solid piece of oak, shaped ruffly by a chainsaw, smoothed to shape with a sander. I decided to abandon the weird crescent design at the rear end of the keel. I made a plywood form to create a boat tail shape to reduce drag. I finally have the keel sealed from the elements with a layer of glass. More layers to go. With the keel being soft over the decades, the bottom of the boat was arched in by a half an inch. I created this fixture out of 2x6 lumber and 2 Ford Crown Vic jacks. The fixture will stay in until the keel is fully glassed.